Business Coach and international best-selling author William R. Patterson shares the new mindset and strategies needed to create millions in the face of new challenges in today's economy. Find a profitable business idea. Quickly build your business team. strategies to grow your business. Cash out of your business. financial goals four times faster. Call us toll-free at (888) 90-BARON. 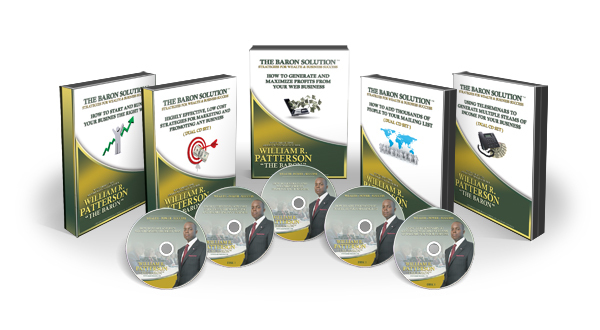 For those who are serious about attracting new customers, increasing their income and growing their businesses, we've put together a very special offer, The BARON Ultimate Business Success Bundle. We have teamed up with Mark Victor Hansen, Jack Canfield, David Bach, and many other extraordinary experts and international best-selling authors on wealth-building, personal development, leadership, business, and success to bring you vital resources designed to move you closer to your business and financial goals. Order NOW for Only $299.95! If you are not satisfied with any BARON product, just let us know within 30 days and we will give you a full refund. Vicky Therese Davis, William R. Patterson and D. Marques Patton are NOT Registered Representatives with the National Association of Securities Dealers nor the Securities and Exchange Commission. In compliance with these regulatory bodies they make no recommendations, nor give any advice. All events, materials, and publications, including but not limited to seminars, teleseminars, books, e-books, audio books, CDs, video presentations, newsletters, and advertisements accessed through this website are designed to educate and provide general information regarding the subject matter covered. They are offered and/or sold with the understanding that neither its authors nor the publisher are engaged in rendering legal, financial, medical, or other licensed professional services. Each situation is different and advice should be tailored to particular circumstances. For this reason, the user is strongly encouraged to consult with his/her own advisor regarding that individual’s specific situation. The authors and publisher specifically disclaim any implied warranties of merchantability or fitness for any particular purpose and shall in no event be liable for any loss or profit or other commercial damage, including but not limited to special, incidental, consequential, or other damages incurred as a result of specific investments or planning decisions made by the user and/or participant.